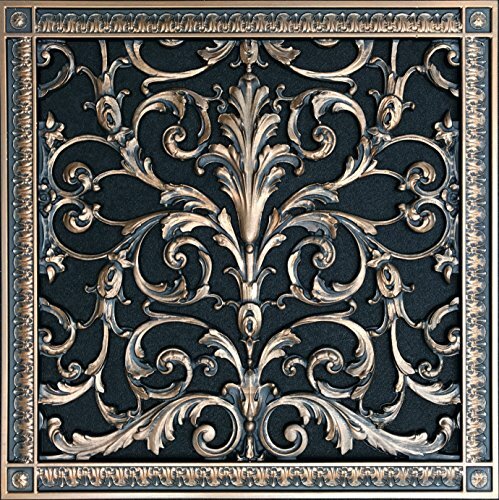 Beaux-Arts is proud to introduce our new line of French, Louis XIV grilles. We do not take credit for the design, but for faithfully reproducing them in precise detail. These elegant grilles were originally hand carved in the late 17th century, when carvers created ornament for the great houses and palaces of Europe. The pinnacle of classical architecture was when King Louis XIV of France built and decorated his Palace of Versailles. These grilles can be used as return air registers, supply vents, vent covers, speaker grilles, radiator grilles, foundation vents, crawl space grilles and more. They are specifically designed for wall and ceiling installation, and not to be used on floors. They are cast from an industrial quality urethane resin, which faithfully reproduces the hand carved details of the originals. In addition Urethane resin is impervious to water and can be used in damp or wet locations, such as a decorative cover for your bathroom exhaust fan, or in and around an indoor swimming pool. Steel grilles will soon rust in either location. In addition resin grilles will not vibrate and make noise like metal grilles do. Our grilles will reduce or completely eliminate the irritating high pitched noise problems of metal grilles. As for finishes, we developed an in-house technique to infuse metallic powders into the front surface of the mold prior to casting, resulting in a cold-fused metallic-plated surface, which is virtually maintenance free. Available finishes are, Rubbed Bronze, Antique Brass, Pewter, Old Wood, Dark Bronze, Nickel, Antique Cherry and Black. We also suggest painting your duct-work behind the grille with flat black paint, before installation. Pre-drilled screw-holes and all necessary hardware are provided to make installation easy. We currently offer these style Louis XIV grilles in 33 different sizes. We are adding new sizes every month and plan to have over 60 sizes by the end of 2016. Incredible three dimensional detail of grille (see expanded view), not just hole punched sheet metal. Our urethane resin cast grilles are equal in surface quality to Investment casting or lost wax casting quality at a fraction of the cost. Much superior to the rough looking surfaces of cast iron or cast aluminum grilles. Maintenance free, you should not have to re-finish, remove rust, corrosion or mold for life of our exterior grade urethane resin grilles. Can be used in damp or wet locations, like exteriors, bathrooms, kitchens and indoor swimming pools or the other rooms on the same HVAC system as the pool room. Easy installation, Predrilled screw-holes and all necessary hardware provided. Our grilles are flat on the back, with no protrusion that needs to fit into the duct-work. Just place over duct, level and screw in. Our grilles will also reduce or eliminate completely the irritating high pitched noise problems often found with stamped steel louvered grilles. Urethane resin grilles will not vibrate and make noise like metal grilles do. Louis XIV Grille; historic reproduction of possibly the best looking grille ever made in Europe, Circa 1680's Use to replace old louvered grilles for wall & ceiling only (not for floors) also meets General Services Administration code #1501003S standards for Historic Preservation Guidelines, for grilles in historic buildings. If you have any questions about this product by Beaux-Artes, Ltd., contact us by completing and submitting the form below. If you are looking for a specif part number, please include it with your message. Decorative Grille, Vent Cover, or Return Register. Made of Urethane Resin to fit over a 20"x30" duct or opening. Total size of vent is 22”x32"x3/8", for wall and ceiling grilles (not for floor use). Decorative Grille, Vent Cover, or Return Register. Made of Urethane Resin to fit over a 16"x16" duct or opening. Total size of vent is 18”x18"x3/8", for wall and ceiling grilles (not for floor use). Decorative Grille, Vent, or Return Air Register. Made of Urethane Resin to fit over a 14"x24" duct or opening. Total size of vent is 16”x26"x3/8", for wall and ceiling grilles (not for floor use).